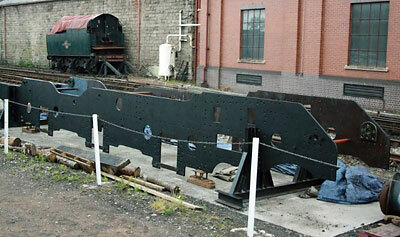 There's more good progress to report both on the loco itself and behind the scenes. The consignment of frame stretching components from Accurate Section Benders, has arrived and we have made good progress machining the stretcher/brake cylinder support fabrication. Also further steel has arrived for the stretchers and drag box areas. 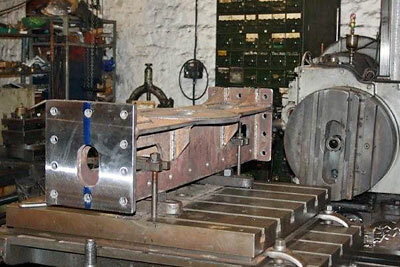 We are awaiting a quote from freelance welder Dave Hewson - who has already made the driver's brake pedestal and the brake cylinder support stretcher - for the fabrication of the substantial smokebox saddle, which fits between the frames and supports the smokebox. The Fund has now become a company limited by guarantee, which means that - should the unthinkable happen - the individual personal liability of members is fully protected and would amount to just £1. This step has been taken as part of the process of becoming a registered charity, which we hope will be completed by the early autumn. This will involve a minor change of name as the Fund becomes a Trust, but does not alter our plans in any way and brings with it the great advantage of being able to claim Gift Aid at 28 pence for every pound donated by a UK taxpayer, which is clearly not to be sneezed at! The Fund is also very grateful for a £1000 donation from the SVRA South East Branch. Brian writes, as he continues with construction of the substantial centre hornblock pattern: "The pattern is complete bar a lick of paint here and there. The oddside is yet to be started. The two major (of at least 7) coreboxes are complete. Most of the parts of these large coreboxes, along with two small ones, were sent to join other stored pattern equipment in Cheshire to reduce the workshop trip hazard whilst I was doing a joinery job for the LNER coach fund." The latest consignment of frame stretchers. 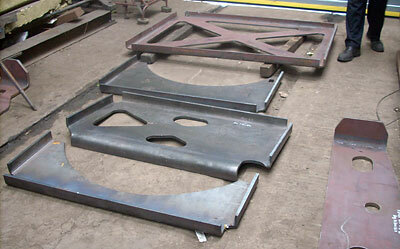 The outer surfaces of the frame plates are now in undercoat black. 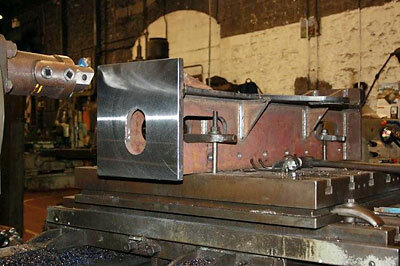 Machining of the ends of the frame stretcher/brake cylinder support. Holes now drilled on the brake cylinder support frame stretcher. Remaining work to be done on this item is machining flat the contact surface for attaching the brake cylinder and drilling the mounting holes.